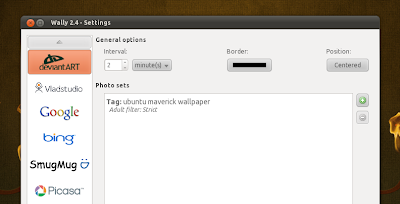 Wally is an automatic wallpaper changer for Windows, Linux and Mac OSX which uses many sources for getting the images: local folders, Flickr, Yahoo!, Panoramio, Pikeo, Ipernity, Photobucket, Buzznet, Picasa, Bing and Smugmug images. What exactly does that mean? Well, you can enter a keyword for Wally to search Google, Flickr, Bing or whatever and Wally will automatically download the images it finds and sets them as your wallpaper - either automatically (every X seconds) or you can manually change it by right clicking the Wally icon in the notification area. You can also tweak lots of settings regarding the images you want Wally to download, like: only use landscape oriented photos, photo has to be bigger than the desktop size and the wallpaper position. A new Wally version - 2.4 - has been recently released, featuring new modules for fetching the wallpapers: Google, deviantArt and Vladstudio. Besides the new modules, Wally 2.4 also adds more photo layouts, Snow Leopard support and fixes quite a few bugs.